You know that sinking feeling you get in your stomach when you’ve misplaced your wallet and think you’ve lost it? I’ll have to cancel my cards! I’ll have to get my ID reissued! The fear is palpable. The damage is tangible. You know what can happen if you lose your wallet, which is why you go out of your way to keep it safe. But you just don’t get the same feeling about the information stored on your computer. It’s natural not to, because they’re pixels on a screen, not money in the pocket. Because it’s data in the cloud, not documents in a briefcase. The problem is that we increasingly see our money in the form of pixels which we use to shop online, and our data and work as documents in a cloud folder. Does that make them less valuable? I bet you’ll agree with me that it doesn’t. The media talks a lot about cyber attacks, but also about their circumstances and consequences. And they have good reason to do so. But here’s the issue: “DDoS attack”, “data leaks”, “compromised credentials”, “CryptoWall 4.0 ransomware” – most Internet users usually ignore security jargon like this. To them, and maybe even to you, it doesn’t mean much. And there’s no one to be blamed here. After all, not everyone has the background to understand why these attacks are dangerous and why they should react to news like this. You’ll often find information about threats that target companies and attacks directed at home users mixed together. So it’s understandably difficult to tell which ones you should worry about. That’s why we decided to do something about it. We’re set on making it easier for you to figure out what you should protect your system against. A strain of malware that cyber criminals use to extort victims into paying hefty sums to regain access to their information. Enlist your computer in a botnet and use its resources to launch attacks on other victims. Give me an example: read about CryptoWall 4.0 – new, enhanced and more difficult to detect. A tactic used by cyber criminals to gather information about you so they can gain access to your bank account or steal your identity. It can use the harvested data to steal your identity and perform all sorts of illegal actions while impersonating you, such as take a loan from a bank. Give me an example: see how the Infamous DarkComet RAT is Used in Spear Phishing Campaigns. Find out more about phishing from our dedicated security guide. An important and advances segments of the malware market in terms of capabilities. It can leave you penniless while on vacation or in another delicate moment where you need funds readily available. Give me an example: find out which are The Top 10 Most Dangerous Malware That Can Empty Your Bank Account. A way to compromise your system fast, before software makers can release an update to close the security holes that expose users. It can also enlist your computer in a botnet, a network of infected computers whose resources are used by cyber criminals to launch other attacks or send spam emails. Give me an example: here’s The never-ending Zero Day created by the fact that Microsoft shut down antimalware support for Windows XP users. It’s usually one of the steps in a more complex fraud scheme that spans over a longer period of time. It can persuade you to give attackers unrestricted access to your computer, as it happens in the context of a tech support scam. Give me an example: read about the Top 11 Scams Used by Online Criminals to Trick You which involve social engineering tactics. A way to collect information you share online and use it for malicious purposes, such as assuming your identity in relation to organizations or other people. It can give you the painstaking challenge of cleaning up after such an attack. Give me an example: see this article on How to Prevent Identity Theft in 20 Essential Steps. Although there are 6 common types of attacks that cyber criminals focus on, keeping safe against them requires less effort than you imagine. The key is to cover your security basics. Yes, it’s as simple as that. It may sound counterintuitive, but following a few, simple tips can make your system stronger against attacks, even the most sophisticated kind. And the fact that you’re reading this article is already a big win! You may read about a lot of cyber attacks on a daily basis, but many of them fall into the categories above when it comes to home users, like you and me. Knowing what these attacks are will help you learn how to get protected against them. 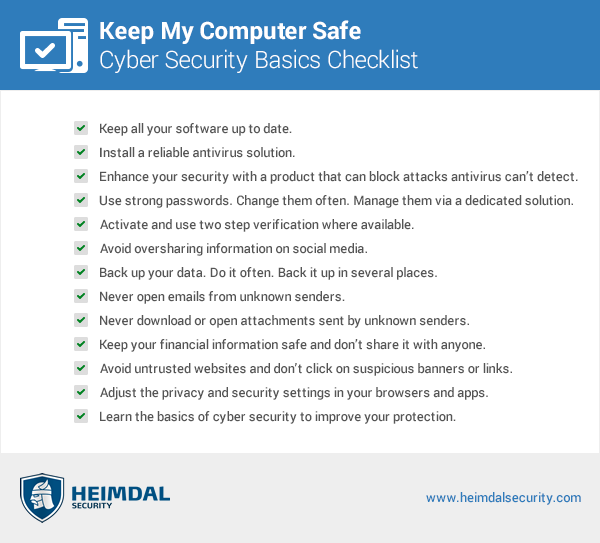 I hope the information above made you say “it’s actually not that difficult to keep my computer safe.” Because it really isn’t once you get started and keep the advice listed here in the back of your mind. See you on the safe side!